I found these while surfing the net. Notice the Italian flag "monogram" on the sleeve cuff in the top photo. Comments on "Lapo Elkann. Nephew Of Gianni Agnelli"
the Italian flag sewen on his ties. with the guys from Dsquared that is sold in Europe. but he still looks good! I don't think he's well dressed. He does wear that awful sweatshirt (he designed it as brand identity manager for FIAT) with suits. He just is no comparison to his grandfather Gianni Agnelli. He's wearing clothes - sorry, I'm just focused on the girl in the green dress. Who is that? Lapo seems like an interesting character. I never heard of him untill i read an article in a Dutch magazine called Jackie magazine. In it, he was compared with Kate Moss. According to this magazine, he apologized to the nation and said that he was ashamed and he messed things up. I think he is still a hottie!! 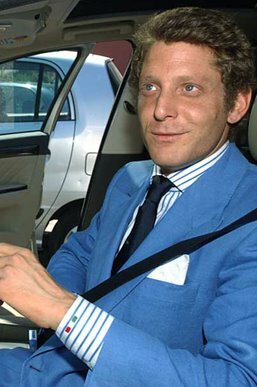 Lapo, you are the best!Keep up the good work!We all make mistakes and you showed the world that it is possible to survive a very messy situation with style. The girl next to Lapo sporting a white FIAT bag is Barbara Berlusconi, the young, clever, strong and independent daughter of Silvio. The girl with the long dress and a diva allure is Martina Stella who showed an incredible lack of style when, after he was found almost dead, quickly had her pr people declare that "they were no longer together".grade for style and sensibility:less that zero! Sorry, my mistake I meant the short green dress but still the diva allure is there. Martina grow up! "Notice the Italian flag "monogram" on the sleeve cuff in the top photo"
Does it mean it's not a French cuff anymore? He was also on the cover of L'uomo Vogue recently in a beautiful story shot by Mark Seliger. sorry folks, the guy's so pathetic, if you think he's cool, god help you. As for the chick, her dad is a criminal, Italy deserves better than to be represented by these clowns. also notice the italian flag on Lapo's tie on the third picture. Also, Martina Stella is a gorgeous woman, and i love her dress. could anyone tell me who's design that is? What you don't know about Lapo is that he is supporting the greatest Italian football team of all time "Juventus". Another fact to share is that Juventus is the team with most fans in the whole world with officially more than 200 million fans supporting this team. In the second pic, Lapo have a DB jacket in SOLARO fabric.